$34.99 & FREE Shipping on orders over $59. Are you ready for unbelievably rich and flavorful coffee? 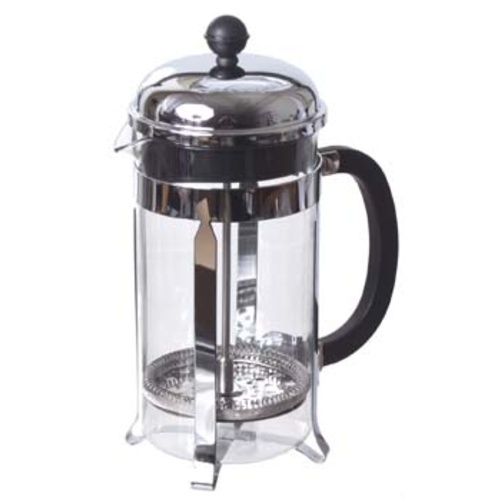 The french press (or "cafetiere" in the UK, and "plunger" in Australia) is considered by many to provide the quintessential coffee drinking experience. Because the water is always in direct contact with the coffee grounds, essential oils and flavor compounds normally left behind in the paper filter remain in the coffee. After pushing down the stainless steel plunger/screen, you are left with an incredibly robust, remarkably flavorful, and richly aromatic cup of coffee. We recommend using a courser grind setting for your beans so that the screen is able to remove the majority of coffee solids. Features a polypropylene handle, with borosilicate glass and a stainless plunging/filtering system. It has a domed lid to seal in the aroma and maintain temperature. 8-cup french presses are ideal for serving 2-4 people. As with all of our french presses, it is completely dishwasher safe. While a little higher price than you might see online, its well built and easy to clean.